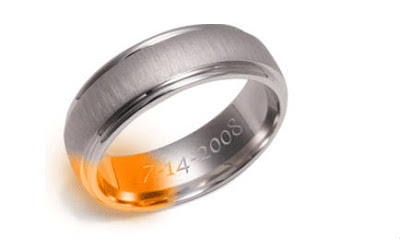 With a binary ring, you can engrave a coded message of your choice, up to 20 characters. They will be rendered in up to five lines of binary code, perfect for the romantically-inclined computer geek! 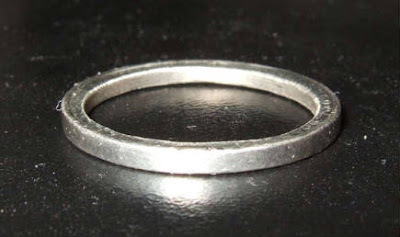 Cory Doctorow of Boing Boing is getting a decoder ring to use as a wedding ring. 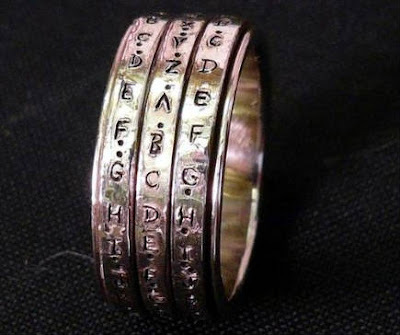 This one has three rotating bands that can be lined up to decode secret messages. He’s now looking for a proper code. Rings that intertwine with each other are quite symbolic. They look great together, but I don’t know how comfortable they would be to wear apart. 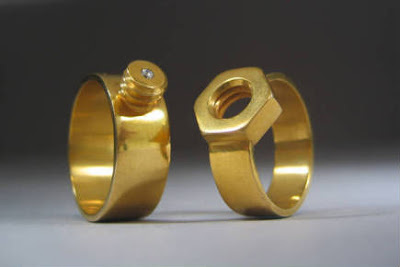 Kiley Granberg designed a wedding ring set as a nut and bolt. Perfect for the mechanically-minded couple. This is symbolic on more than one level, if you know what I mean. 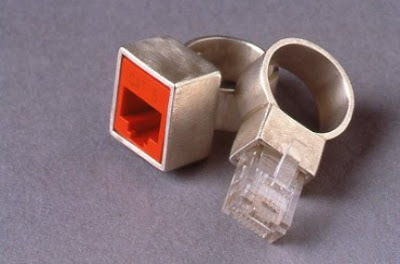 Taking the connectivity idea a little further, Jana Brevick designed Cat-5 Rings that connect with each other by ethernet connectors. They are available at her Etsy store. 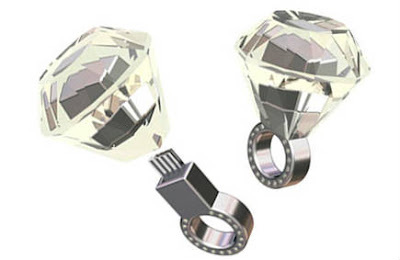 Gas Design and Jennifer Flume have developed the USB Flash Drive Swarovski Crystal Engagement Ring. The two wearers can connect the rings and share data! The ring was created in partnership with famed crystal company Swarovski. It would be cool to have a ring that you could play with. This sphere ring made by acanthusleaf is modeled on a historical pattern that has four rings hinged at different points. Laurie Cavanaugh, who made this ring, has them available at the Mad Jeweler’s Workshop. There are even rings with embedded technology. The Remember Ring will remind you of your anniversary by getting hotter! Too bad it’s only a concept and not available for sale… yet. Make your own wedding rings is an individual statement, and will save money, too! You can make rings out of coins, but keep in mind that it is illegal to deface US currency. Still, not all coins are US currency. Watch a video of a similar process here. What could be more individual than your own DNA? 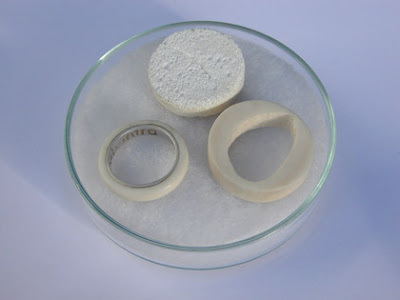 Scientists and artists have collaborated to make rings out of the wearer’s bone tissue. The tissue is taken from a wisdom tooth and grown on a scaffold in the laboratory. However, the original company website is no longer active. The decoder ring is my favorite. Probably because it is just so quirkly. then again, then all are!